During Union Home Minister Rajnath Singh’s visit, insurgency was stated as the main issue troubling Manipur. The visit was claimed to be part of the vision of accelerating development in Northeast India and the implementation of the ‘Act East’ policy. The delegation also included the Union Minister of State for Home Affairs Kiren Rijiju who stated that Moreh will be India’s gateway to Southeast Asia. The team inspected the construction works of the integrated check post, land custom office and immigration office in Moreh. 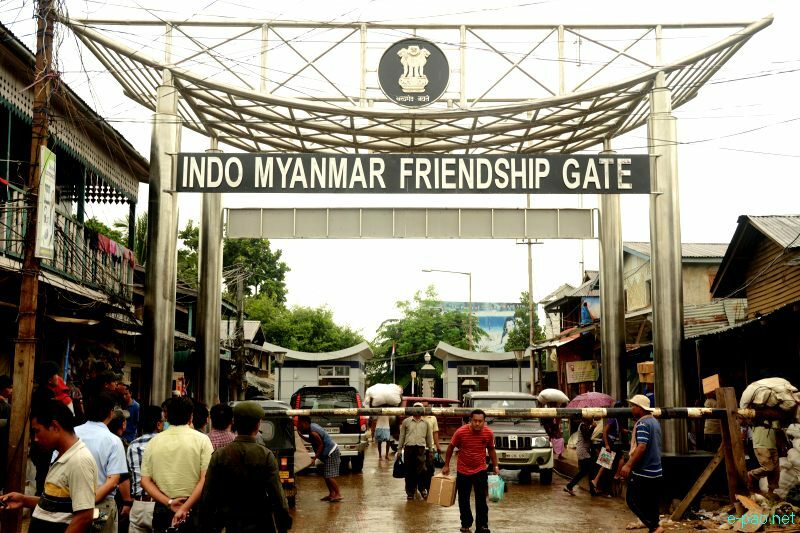 The demand for passport office in Imphal and immigration offices in Moreh and Namphalong are connected to opening the eastern gate to Myanmar for visiting the neighbouring Southeast Asian countries. This is a long pending job with no certainty. But developments taking place in Myanmar, China and other Southeast Asian countries have something to tell. It is about opening the eastern gates to China, Lao People’s Democratic Republic (Lao PDR; in short Laos) and Thailand through Myanmar for the people of Manipur and other parts of India. First of all, the Imphal to Mandalay bus or flight service and then onwards to Kengtung (Kyaingtong) in Shan State will be necessary. The road from Kengtung to Tachileik is not very long and the Luang Namtha and Bokeo provinces of Laos are a stone’s throw away from Tachileik. In January 2007, Wan Pong checkpoint in Tachileik and Muang Mom checkpoint in Bokeo were upgraded to facilitate tourists. Moreover, in May 2009, a memorandum of understanding (MoU) on establishing sister cities between Bagan (Myanmar) and Luang Prabang (Laos) was signed for cooperation in tourism. On 16 February 2013, a ground breaking ceremony was held at Xieng Kok for the construction of a bridge over the Mekong River, the first and the only bridge to link Myanmar to Laos. The Mekong River demarcates the border line of about 235 kilometres between the two countries. The Myanmar-Laos Friendship Bridge linking Kyainglap (Kenglap) in Tachileik district and Xieng Kok in Luang Namtha will make this region an important centre of trade and regional connectivity. In fact, Tachileik in the Triangle Region is an important border trade centre. The border town of Mae Sai lies on the Thai side of the Mae Sai River that flows between the two border towns. Unfortunately, the region is a hotbed of insurgency, arms trafficking, drug trafficking, human trafficking and other trans-national security issues. This eastern tip of Shan State shares borders with China, Laos and Thailand. The Myanmar-Laos border falls within the Triangle Command of Myanmar Army. It was set up in 1996 with headquarters in Kengtung. Here, tracts of border areas are still controlled by the United Wa State Army (USWA) and the National Democratic Alliance Army (NDAA), also known as the Eastern Shan State Army (ESSA). To face the challenges, Myanmar has strengthened security cooperation with Laos. During Laotian Prime Minister Bouasone Bouphavanh’s visit in June 2010, the two sides agreed on regular exchange of high-level visits, promotion of good neighbourly relations, peace and stability in border regions and improvement of road transport. Myanmar officials from the Ministry for Defence, Foreign Affairs, Ministry for Progress of Border Areas and National Races, Ministries for Transport and others took part in the meetings. Before the Myanmar election, Senior General Than Shwe paid a state visit to Laos in October 2010. He called for strengthening friendship and border security mechanism. The delegation also included Lieutenant General Min Aung Hlaing of the Defence Ministry, Commander of Triangle Region Brigadier-General Than Tun Oo and other officials. The MoU on provincial regional border committee signed during the visit was not just to control drug trafficking and flow of precursor chemicals. Controlling the borders for facilitating the national reconciliation and ceasefire with ethnic armed groups in Myanmar was the agenda. It was followed by President Thein Sein’s visit in March 2012. The two countries agreed to re-open direct flights and to cooperate in border security. Also, the agreement for the friendship bridge was signed during the visit on 22 March 2012. Enhancing security cooperation and improving transport infrastructures for economic development and tourism are being actively pursued. Interestingly, China has strong stakes in the Mekong River basin security cooperation and wants to curb the problems created by the lawless Golden Triangle region. Yunnan province of China is badly affected by the synthetic drugs manufacturing and poppy cultivation in the region. The stretch of the Mekong River from Yunnan to Thailand has become a haven of drug traffickers, smugglers and other cross-border crimes. The difficult terrains, thick jungles and lack of administrative controls in the region have been exploited by the criminals of all sorts. Insurgency in Myanmar also complicates the security situation. On 5 October 2011, two Chinese cargo ships were attacked killing 13 Chinese sailors and injuring many others. This incident pushed China closer to the Mekong River affairs especially to strengthen security cooperation with the neighbouring countries. Consequently, on 26 November 2011, a joint statement of the Ministerial Meeting on Cooperation in Patrol, Law Enforcement was adopted by China, Laos, Myanmar and Thailand. This marked the agreement on the four-nation joint patrol along the Mekong River starting from Guanlei port in Xishuangbanna (Sipsongpanna) in China to Chiang Saen port in Thailand. The Wan Pong port in Myanmar and Xieng Kok port in Laos have strengthened security measures to prevent similar attacks. After a joint operation, the perpetrators of the Mekong attack were arrested by Lao law enforcement agencies and they were handed over to the Chinese authorities. The first joint patrol began on 10 December 2011 and the 30th round was conducted in January 2015. Security measures along the river, multilateral cooperation and intelligence sharing are significant developments. Now, the criminal networks operating in the region are experiencing the might of the joint law enforcement operations. In August 2012, a MoU was signed between Laos and the China Road and Bridge Corporation (CRBC) for constructing a road that connects Sing district of Luang Namtha and Tonpheung district of Bokeo along the Mekong River. Similarly, the Fourth Thai-Lao Friendship Bridge across the Mekong River was opened in December 2013 to improve transportation between Thailand and Yunnan via Laos. It connects Chiang Khong in Thailand with Houayxay in Laos. It is part of the Greater Mekong Sub-region’s (GMS) North-South Economic Corridor constructed with financial support from Laos, Thailand, China and the Asian Development Bank. Whether these countries will be successful in turning the Golden Triangle Region into a centre of economic growth is not yet clear. However, cooperation on controlling drugs, arms smuggling, human trafficking, precursor chemicals and poppy cultivation are gaining momentum. Subsequently, their activities to control insurgency, border security issues and for economic development under the GMS and ASEAN are knocking hard the eastern gates. Insurgency, nation-building process, mutual trust between India and Myanmar and other external factors are also pushing the eastern gate to Myanmar. Moreh will be a gateway to Southeast Asia but it will not be realised until the eastern gates to China, Laos and Thailand are opened through Myanmar. India’s long road to Mandalay should not shatter Manipur’s ‘Mandalay dream’. The resource rich Myanmar is opening up to the world and its economic construction is at a fast pace. Is New Delhi sincere about opening the eastern gate to Myanmar? Union Home Minister’s visit to Moreh and the recent field survey of the road conducted by a joint team of the Indian and Myanmar officials might answer the question. If the answer is yes, then Manipur will cross the Chindwin and Ayeyarwady (Irrawaddy) Rivers to reach Mandalay. The next question is: how many years will it take to cross the Mekong River to reach Lao PDR? Only New Delhi can answer the question. This article was posted on February 17, 2015.